What if your roommate is your soul mate? A joyful, quirky romantic comedy, Beth O'Leary's The Flatshare is a feel-good novel about finding love in the most unexpected of ways. Tiffy and Leon share an apartment. Tiffy and Leon have never met. After a bad breakup, Tiffy Moore needs a place to live. Fast. And cheap. But the apartments in her budget have her wondering if astonishingly colored mold on the walls counts as art. Desperation makes her open minded, so she answers an ad for a flatshare. Leon, a night shift worker, will take the apartment during the day, and Tiffy can have it nights and weekends. He’ll only ever be there when she’s at the office. In fact, they’ll never even have to meet. Tiffy and Leon start writing each other notes – first about what day is garbage day, and politely establishing what leftovers are up for grabs, and the evergreen question of whether the toilet seat should stay up or down. Even though they are opposites, they soon become friends. And then maybe more. But falling in love with your roommate is probably a terrible idea…especially if you've never met. You’ve got to say this for desperation: It makes you much more open-minded. Beth O’Leary worked in children's publishing before becoming a full time author. The Flatshare is her debut novel. 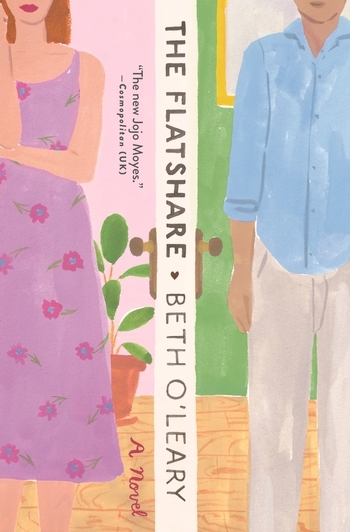 The idea for The Flatshare came to Beth when her doctor boyfriend was doing long night shifts as part of his training and they could go weeks without seeing each other, but she could track his life by how many cups of coffee were left on the counter, by how much he’d eaten and whether the bookmark in his novel had changed locations. It made her wonder – what could you learn about someone if you lived together but never overlapped?